Place fennel seeds, salt, and pepper in a spice grinder and pulse until finely ground. Place pork tenderloin on baking tray; coat with the fennel mixture and allow to rest for at least 30 minutes. Transfer pork to oven; roast until the internal temperature reaches 160°F. Remove from oven and allow to cool to room temperature. When pork has cooled, slice it on the diagonal into 1/8-inch slices. Roll the pork slices into a cone shape, and place a dallop of the cherry relish in the center. 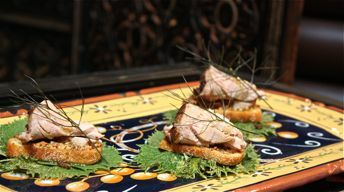 Spread some mustard on a crostini, and top with a pork cone to serve. Preheat oven to 350°. In small oven-safe pan or crock, toss shallots and garlic with olive oil; cover with aluminum foil. Roast in oven until very soft, about 40 minutes. Meanwhile, in a saucepan over medium-high heat, combine cherries, Merlot, sugar, clove and nutmeg; bring to a boil. Reduce heat to simmer; cook until liquid is reduced to a glaze. Transfer cherry mixture to a blender with roasted shallots and garlic; puree until smooth. Transfer relish to small bowl and set aside to cool.